Catch A Drip: originally designed to distribute AC condensate, Catch a drip attaches to the rain barrel faucet and slowly distributes the water along the hose line up to 50 feet. It is not a soaker hose. It is a regular hose with dripping points along the way. Rain Barrel Soaker Hose: Most soaker hoses require pressure- this one works with the ordinary pressure of a rain barrel. Soaker hoses are ideal for "soaking" the ground over a the entire length (50') of the hose. Gravity Fed Drip: systems come from a variety of vendors. DripWorks has some good possible layouts. These systems are also callled Low Flow Irrigation systems. 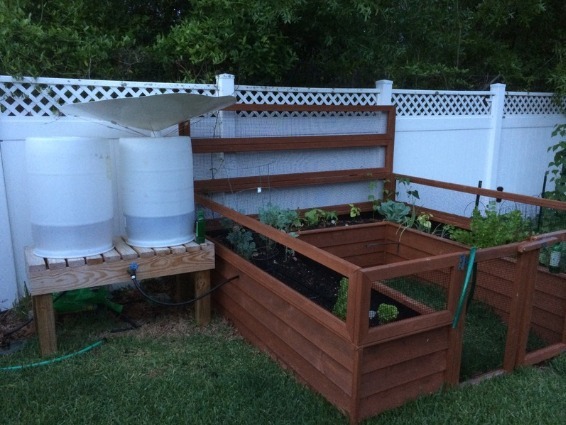 Some of our customers have designed their own rain barrel based drip systems tricked out with timers from a centralized piping system. (see photo) Some timers are even solar powered. Self-watering: what is a drip system if not a hose with tiny holes in it. The same can be done with old plastic bottles to create your own self-watering dripper. Another possibility is to use capillary action or wicking to have the water come from underneath. This Pinterest page has some guidance. RB dip and Hand watering: this is our personal favorite. It's not automated but it sure is easy. If you have a full rain barrel that has topside access, it takes just a few seconds to fill a watering can by dipping. Watering by hand is not so bad if the barrel is located right next to the garden.